Whether Halloween is just your favorite of all holidays or you enjoy freaking people out in the supermarket when you phone rings, there are several apps and sites available that offer ringtones in even the most sinister of laughs for your Android and Apple mobile devices. And the best part is you can get these for free! Offered by Magi Ent., Scary Ringtones offers a plethora of spooky sounds to your ringtone arsenal. Available for both Apple and Android, the mobile app offers about 45 different ringtones for you to enjoy. These free apps offer sounds like scary music, suspense, death chords, witch cackle, evil laugh and the ever-popular creaky door. There are also more sinister sounds like a demon screeching let me out and a child echo of help me. While this app does have some ads, they don't typically interfere with your listening pleasure too much and it does offer tips for listening and saving ringtones. If you have an iPhone, never fear, because this app offers you step-by-step instructions for adding that ringtone to your library. 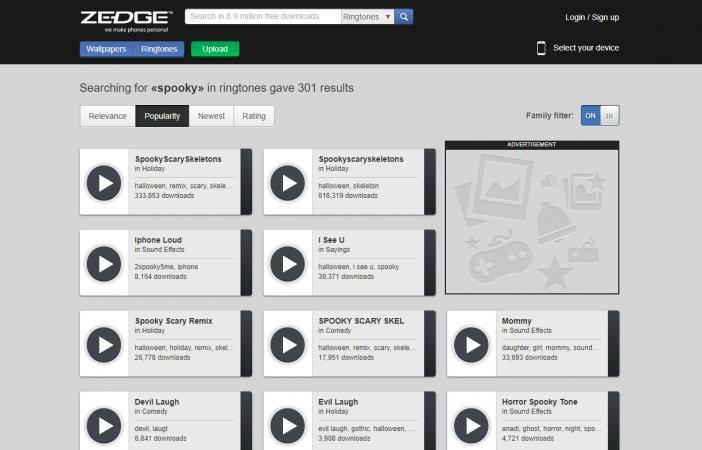 Another site you can add to your spooky ringtone remix is Zedge. Boasting over 300 sounds that fit your spooky needs, you can easily download this in app form to your Apple iPhone or Android device. The website allows you to view all the sounds that your ears can take before you choose which ones to download. With the app, you can filter the sounds by holiday to find Halloween sounds or simply search spooky sounds. The mobile app does have sponsored ads, but they don't pop up when you are trying to view or download your ringtones. Specific sounds that you are privy to on Zedge include Halloween remixes, evil laugh, spooky scary remix, haunted mansion, monster mash, and even the psycho sound effect! Created by Nikola Bogdanovic, this collection of horror and spooky sounds for iPhone is enough to make even the bravest of individuals blood run cold. The free app allows you access to 10 different creepy sounds like dark night, scream, wicked laugh, horror and creepy. It should be noted that the pop-up ads may prove frustrating for some users. The interface is really easy to navigate; just tap on the sound you want. The sound quality is quite good too. Only offered for Android, this app by Double J Ringtones offers an array of bloodcurdling Halloween and spooky sounds like Halloween scare, fear, terror and fright. The cool Halloween interface lets you easily set the ringtone for a contact, notification or alarm. The app features 47 ringtones in total. If you like hearing doors creak or wolves howling at the moon, or even want one that is similar to The Addams Family theme sound (Halloween scare), this app has you covered. While there are some ads to contend with, they don't interfere with your listening too greatly. Another free Android app worth trying is Extremely Scary Ringtones. Rated Teen, this app features some extremely scary sounds like demon laughter and air raid. You can also enjoy the coveted psycho screams. You'll find 51 sounds in total, including some unique sounds like the raven, scary finale and scary modern music, which is similar to a modern dub step with scary music. Another ringtone app available for both Apple (via the iTunes Store) and Android (via the Google Play Store) is Mobile9. 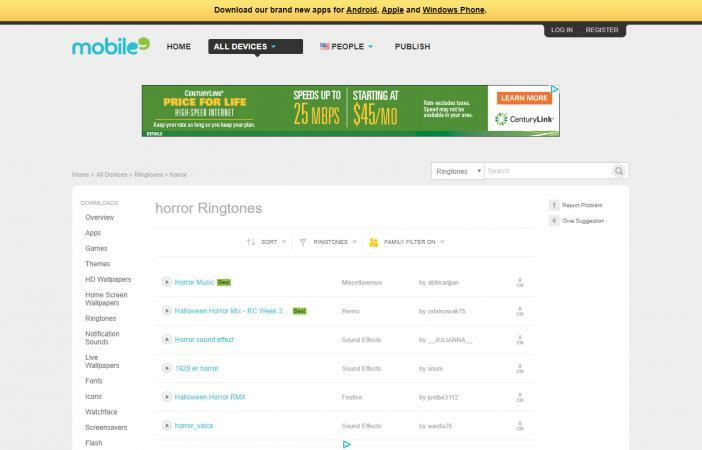 This company offers a few Halloween-themed ringtones to add to your collection. Expect remix sounds like spooky Halloween remix, which combines several of your favorite spooky sounds and phrases like psycho, doors creaking and screams. You can also find fun spooky sounds like horror remix, which combines dozens of known Halloween songs and sounds like Jigsaw from Saw, Nightmare Before Christmas music and more. Vary the words you search to discover all sorts of different spooky sounds. If you don't want to bog your phone down with sounds you don't need, or you only need a specific spooky ringtone, you can download a variety of individual ringtones through iTunes for iOS or the Google Play Store for Android. These ringtones, which run the gamut of spooky sounds and sounds, can cost anywhere from $0.69 to $1.29 each. A few of the more unique ones are designed to let you know your son, mother, daughter, sister, or other family member are calling. These sounds have a beat behind a screeched whisper letting you know who is calling. You can also find fun Halloween songs. No matter how you use your creepy ringtones, there are several places that can help you add to your collection. You don't have to be limited by your technology either because there are an array of apps available for both Apple and Android products. Now get downloading and enjoy a good scare all year round.